After a great start of the year, working on B*Tree and other Indexing Data Structure, it's about two month that I'm experimenting with User Interface... My Love still remains Networking and File-Systems but it's fun drawing images, shadows and UI Components. Ok, Networking and Bytes can wait till next week. Today I've watched the PALM Pre Preview, No Back buttons, No Save buttons touch capability outside the glass... Data Abstraction... It's really nice. 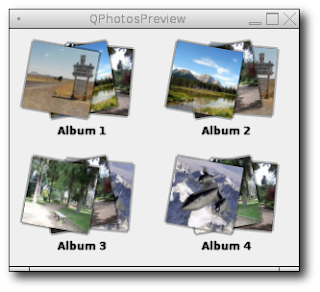 You can find the Source Code Here: Qt4 Photos Preview Source Code.